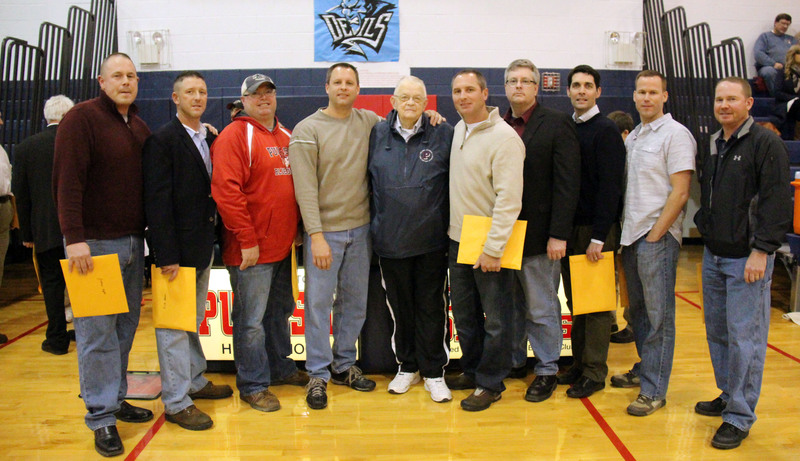 The 1988-89 Pulaski Varsity Boys’ Basketball Team was honored at a ceremony on December 6. Pictured are members of the team who were able to make the ceremony with Coach Jones. The recognition took place following the JV basketball game between Pulaski and Weedsport in the Pulaski High School gym. The team from the 1988-89 season finished with an overall record of 22-3, and captured the only sectional basketball championship in school history. The following individuals were recognized at the ceremony on December 6: head coach Winfield “Bud” Jones; players Ray Sliwoski, Jr., Julius Hefti, Jeff Snyder, Rich Insel, Tony Pollic, Tom Trump, George Stewart, Greg Quartz, Chris Watson, Chris Mattison, Mark Sliwoski, Mike Poole, Matt Murphy, Mert Shaw, Derek Pollic, and Mike Leib; and managers Jamie Hefti and Ryan McGrath.